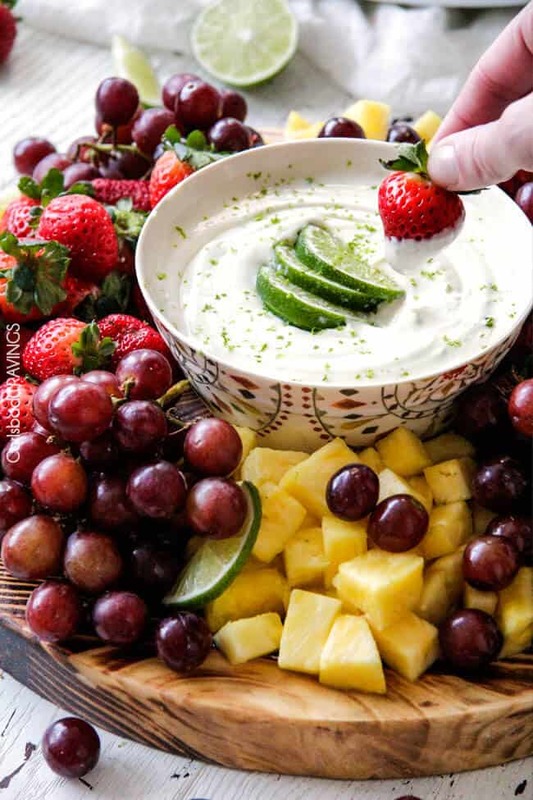 Sweet and tangy Key Lime Cheesecake Fruit Dip is unbelievably creamy and the very BEST way to eat fruit! This Fruit Dip is wonderfully silky and the ideal make-ahead snack or appetizer that everyone can’t get enough of! It makes a beautiful spread for any party, baby or bridal shower! Spring is upon us which means everything fruit! 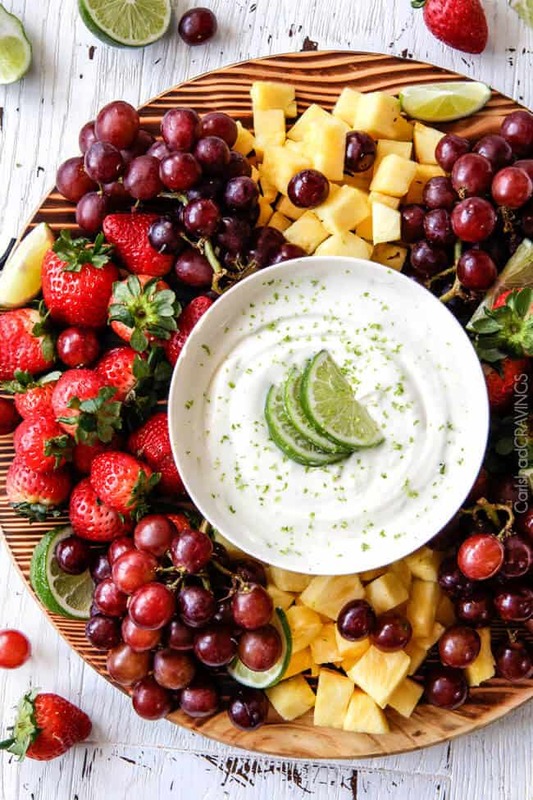 From my Pina Colada Fruit Salad to my Watermelon Pineapple Fruit Salad to my Grilled Pineapple Salsa, I am obsessed with spring and summer fruits and one of my absolute ways to devour fruit is dunked in this Key Lime cheesecake Fruit Dip! I am soooooo in love with this fruit dip. borderline obsessed. 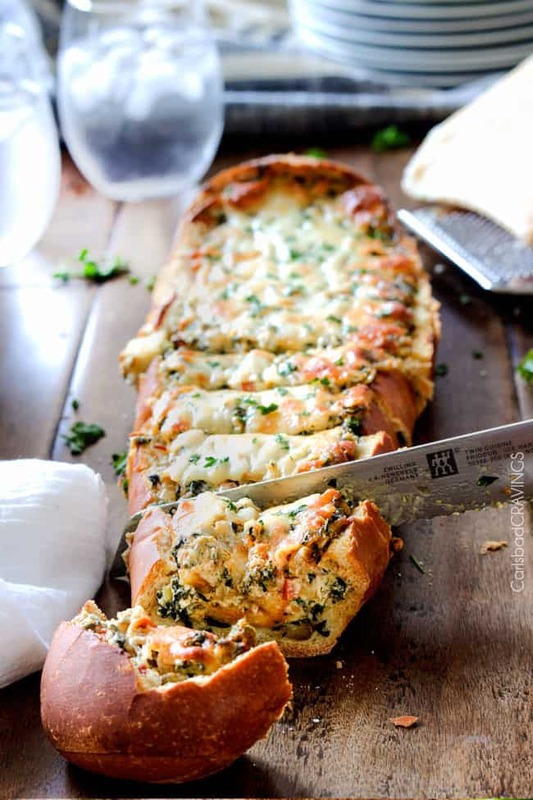 Its quick, easy, unbelievably delicious and sooooooooo creamy! For my first Cheesecake Fruit Dip test run, I did a test run with just key lime yogurt, cream cheese and sweetened condensed milk and although it was really good, it was missing a little something-something. So I ran back to the store and added Pina Colada Yogurt. Magic. First I dunked my fruit in the silkilicious fruit dip until the fruit was gone. Then I was smothering anything I could get my hands in this on from granola bars to pretzels because in my book, dippers are just a vehicle to envelop in luscious, creamy Key Lime Cheesecake Fruit Dip so I can consume luscious, creamy Key Lime Cheesecake Fruit Dip. I should have just grabbed a spoon. 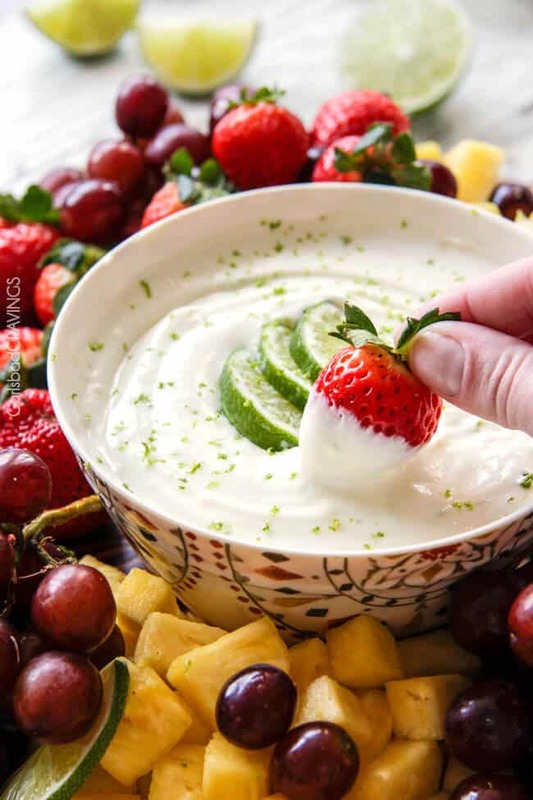 What’s almost as amazing as the silky, creamy Key Lime Cheesecake Fruit Dip, is the fact that it can be whipped up in just 5 minutes! 5 minutes! Now that’s the easiest cheesecake I’ve ever made. Simply whip together Key Lime Yogurt, Pina Colada Yogurt (I used Yoplait®), cream cheese (I use light), sweetened condensed milk, the juice and zest of one lime and a splash of lemon juice. Sweet, tangy and perfect for dipping! 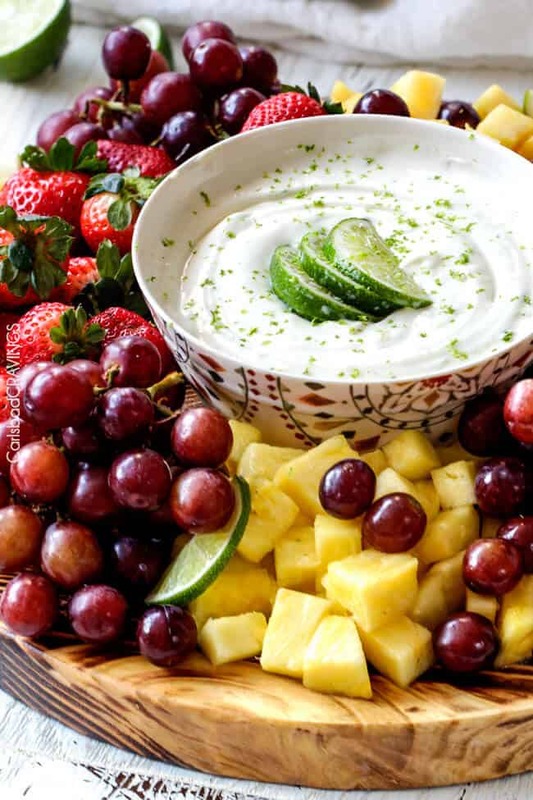 If your taste buds just can’t wait, then you can devour the Fruit Dip right away, but the Dip thickens and the flavors are even more unbelievably delicious if refrigerated overnight or even 24 hours, making this Cheesecake Dip the perfect make ahead snack or appetizer any time your crave something a little more decadent, a little more sweet, a lot more delicious. For me, that’s all the time. 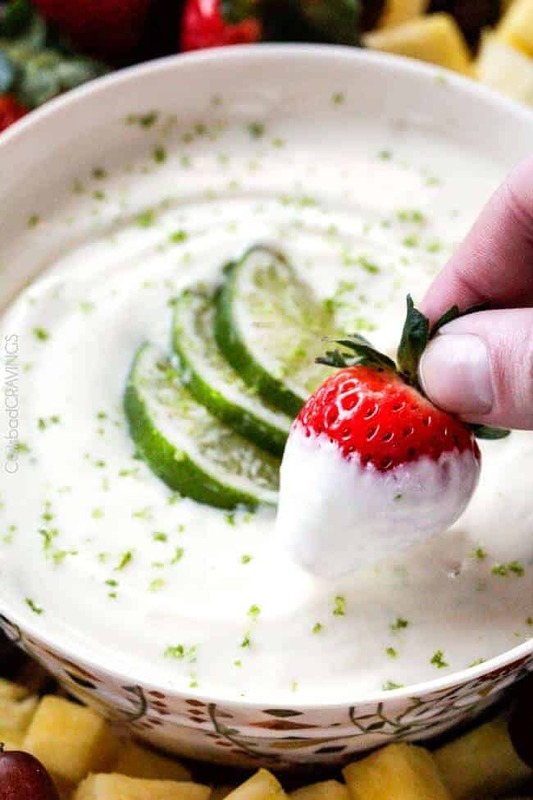 Key Lime Cheesecake Fruit Dip. The next time those need something fresh and sweet and smooth and creamy cravings hit, you’ll know what to do. And next time, I ‘m just using a spoon. 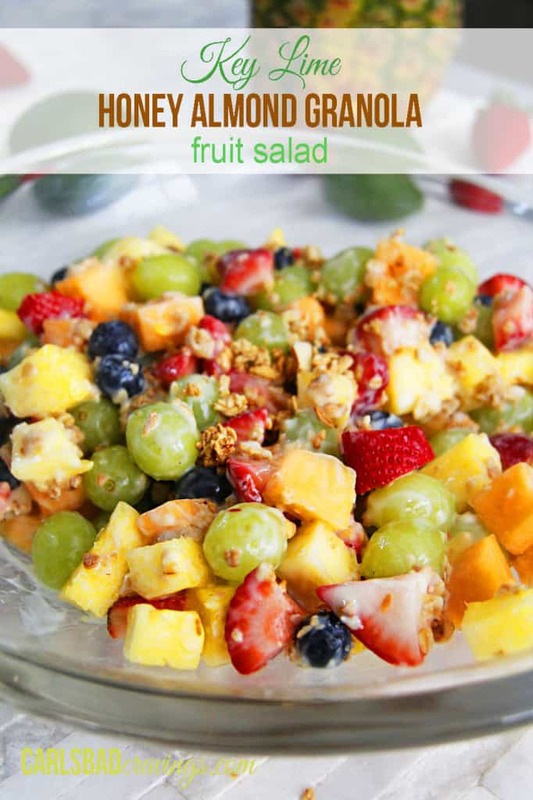 Want to try this Fruit Dip Recipe? Pin it to your Appetizer, Dessert or Summer Board to SAVE for later! 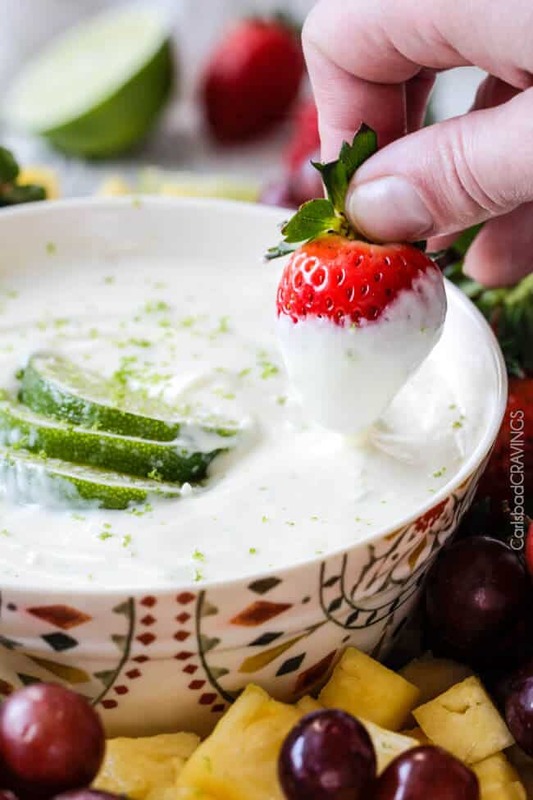 Sweet and tangy Key Lime Cheesecake Fruit Dip is unbelievably creamy and the very BEST way to eat fruit! This Fruit Dip is wonderfully silky and the ideal make-ahead snack or appetizer that everyone can't get enough of! It makes a beautiful spread for any party, baby or bridal shower! Add cream cheese to a large mixing bowl and beat until very creamy. 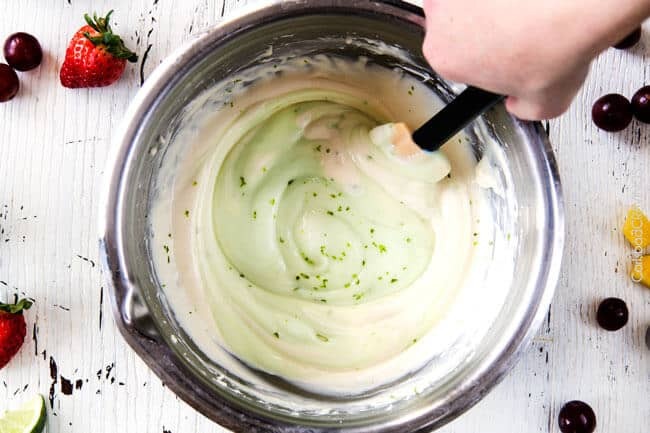 Beat in sweetened condensed milk, yogurts, vanilla, lime juice and 1 tablespoon lemon juice and continue to beat until the mixture is light and smooth, about 1 minute. Stir in lime zest. Taste and add additional lemon juice if desired. Dip will thicken as it chills. Time permitting, refrigerate overnight up to 24 hours for best results. Store leftovers in an air-tight container in the refrigerator for up to 5 days. 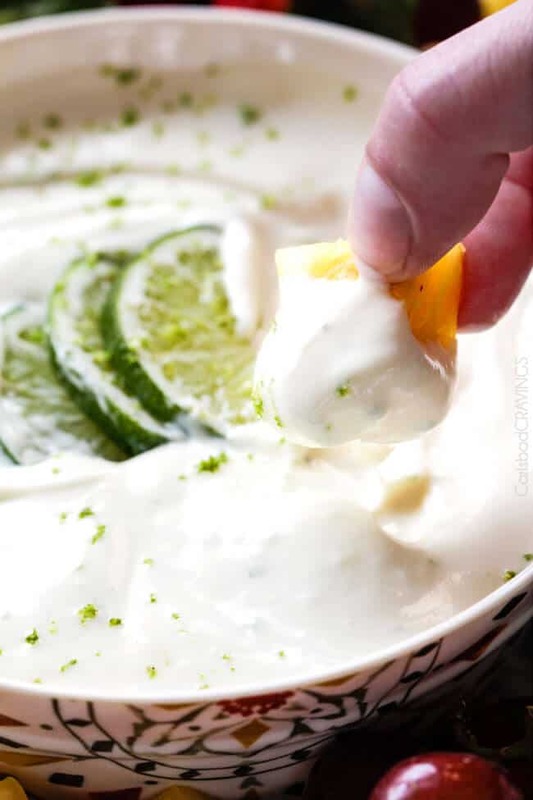 The lime cheesecake dip looks amazing and very simple. This just may be the first recipe I serve at on the new back patio this spring! A new back patio – so fun! 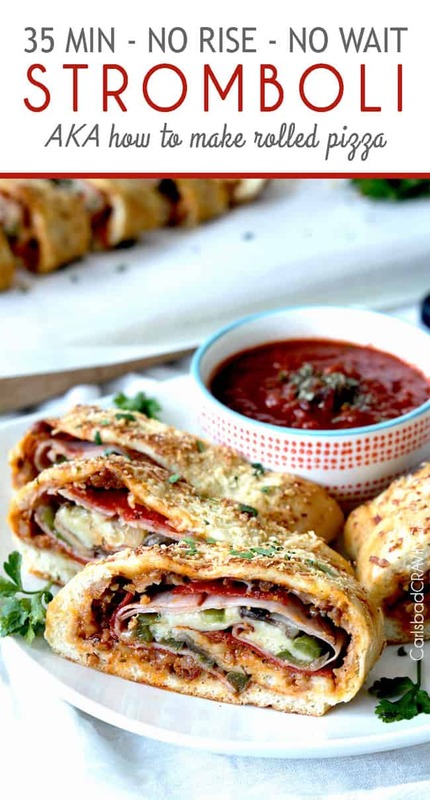 perfect for friends and good food and Spring! This dip would be perfect – and so easy! Thanks so much Cara! Hi Jen! I have to give this recipe to my best friend in Arkansas…she is a key lime junkie! A couple of years ago I ordered a dozen key lime filled donuts at a local bakery and express shipped them to her for her birthday. She will love this! You are the most thoughtful friend ever! Seriously, that is the sweetest! I think she will love this too – hopefully it will become a new favorite 🙂 Thanks Dorothy, have a fabulous weekend! I love everything key lime and the addition of the pina colada yogurt sounds delicious! Can’t wait to make it! I am excited for you to make it too Mary! I think you will love it – especially with the pina colada yogurt! Thanks Mary! Today I made your key lime cheesecake fruit dip. Absolutely Heavenly! My grocery store did not have the pina colada Yoplait, so I substituted tropical. I could not stop sampling the dip. My fear is that there will be none left to serve to my guests tomorrow for Easter (their loss). Haha! Their loss indeed 🙂 I am so happy you loved this dip and the tropical yogurt sounds like a great substitution. Thanks so much Cara and I hoe you have a very Happy Easter! Hi Tara, thank you for your kind comment! I always have fun styling photos – especially when I get to eat them afterwards:) I love thee idea of having this dip at your parent’s 50th wedding anniversary – I think everyone would love it – but I am with you – you might need to double check by sampling it before then! Good luck with the party planning and a big congratulations to your parents! Made this yummy dip for a brunch and the ladies couldn’t get enough!!! We ate more dip than fruit 🙂 I’ve tried so many more of your recipes I now have a binder labeled Carlsbad Cravings. 🙂 Thanks for another keeper!! Prepared this for the first time last night. Tried it tonight after 24 hours of refrigeration to thicken to the perfect cheesecake/fruit dip smooth creaminess. Ran out of dippers for this AMAZING and HEAVENLY dip. Can’t wait to make this for 4th of July festivities. Thanks for bringing us what will likely be another family favorite classic. That is awesome Karrie! I am thrilled you loved this and it will “likely be another family favorite classic” – seriously the ultimate compliment! I hope you have a very Happy 4th with lots of Cheesecake Dip!